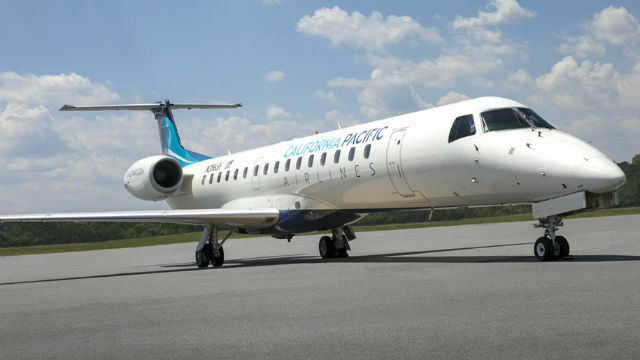 California Pacific Airlines announced it will begin flying from McClellan-Palomar Airport in Carlsbad to San Jose, Reno and Las Vegas in November. The airline, which already flies a number of routes in the Midwest, said its inaugural West Coast service will begin Nov. 1 for San Jose and Reno and Nov. 15 for Las Vegas. “Today’s announcement marks the culmination of a multi-year effort that will bring significant convenience in air travel between San Diego’s North County and the top western-region destinations,” said Airline Chairman Ted Vallas on Monday. The airline will initially operate 50-seat Embraer ERJ145 jets on the nonstop routes. Vallas said his airline will be a more convenient choice for many North County residents than a flight out of San Diego International Airport. “Passengers can spend less time fretting the drive to and from the airport, and spend more time enjoying their destination,” he said. The initial flight schedule between Carlsbad and San Jose is two round trips each weekday with a single round trip each Saturday and Sunday. “We are extremely pleased to be one of three launch airports for California Pacific Airlines and the convenient, nonstop service it will offer to travelers between San Diego North County and Silicon Valley,” said John Aitken, director of aviation for Mineta San Jose International Airport. The airline will fly a single round trip to Reno on Monday, Wednesday, Friday and Sunday, and a single round trip to Las Vegas on Sunday, Tuesday and Thursday.